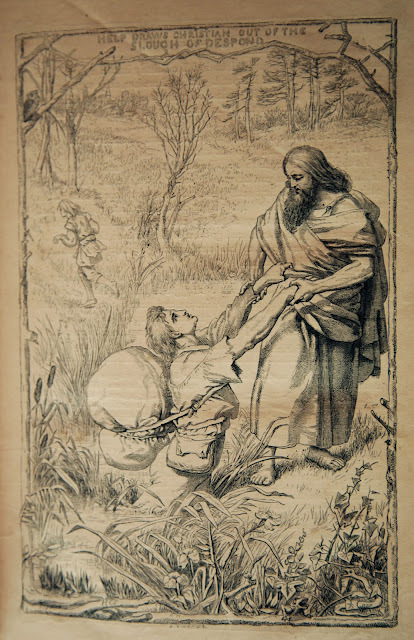 In 1678, when John Bunyan was choosing a landscape in which the hero of The Pilgrim’s Progress might experience despair, he looked no further than a bog. They drew nigh to a very miry slough that was in the midst of the plain, and they, being heedless, did both fall suddenly into the bog. The name of the slough was Despond. Since Bunyan’s time much has changed in the world. But whether you call it slough, bog, mire, marsh, mud, swamp or sludge, there are still few who’d name such a place their favourite. And in the case of our mate Jim, there’s certainly no trace of Eeyore*, which is probably why Tim and I haven’t worded him up on our dirty little secret. 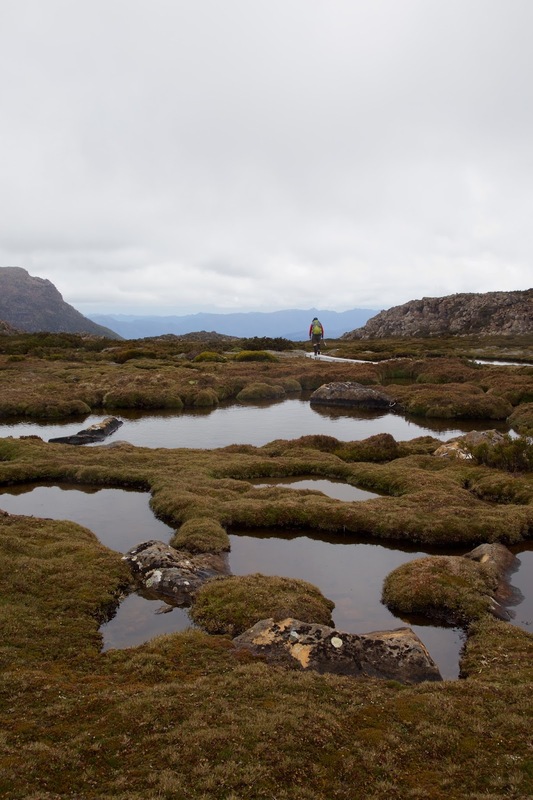 The truth is we’re determined to visit some bogs in the high alpine zone of Tasmania’s Mt Field National Park. The three of us have spent our first night in a private hut near Lake Dobson inside the park. A hut situated close to your car has its advantages, including the ability to cart in luxury items. 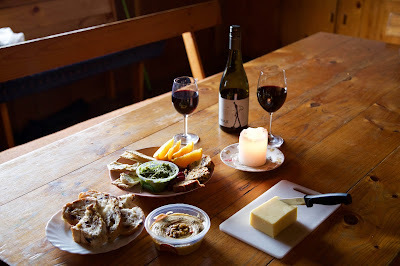 A night of fine food – or in Jim’s case a stale bread roll – plus fine wine and plenty of chocolate, has left us needing some compensatory exercise. Our morning weather is clear, though rain is forecast later. That rules out the very long day trip to Mt Field West, but also precludes a day sloughing about in the hut. After a bit of pretend debate we choose what Tim and I already have in mind: the Tarn Shelf/Newdegate Pass/Rodway Range circuit. And the highlight of the walk, for us at least, will be the globally significant string bogs around Newdegate Pass. But first we have to traverse the familiar – and favourite – territory of Tarn Shelf. 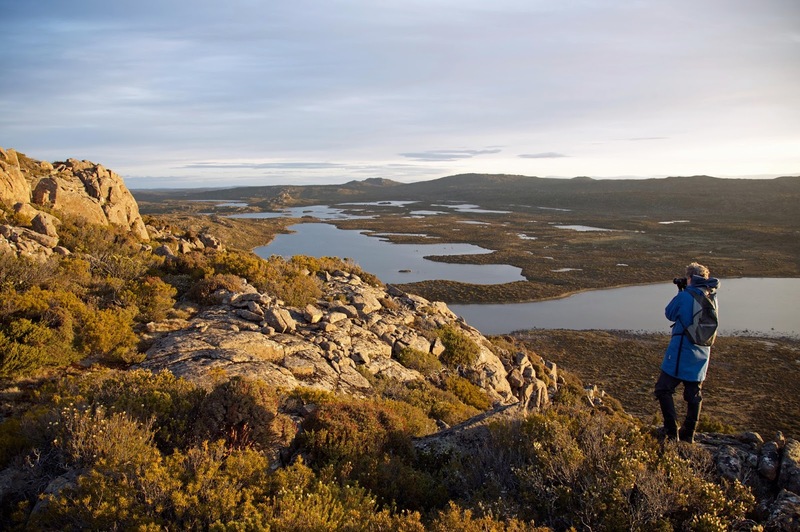 Pilgrims of a different kind come here every autumn, as the tarn-dotted plateau has one of the best accessible displays of deciduous fagus in Tasmania. We’ve been among those pilgrims many times, but have also visited in every other season. Jim and I chat about previous visits, some shared, some not. 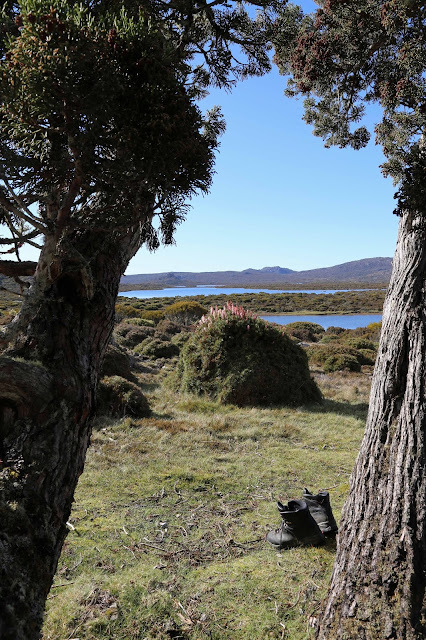 We eventually near Lake Newdegate Hut, now in poor condition, and joke that both the hut and our knees have seen better days. But blustering about our “mature-age” fitness, Tim and I con Jim into heading further up rather than turning around here. We plod up the scrubby slope; totter over the boulder field; amble to the top of the slope, and there we are: among the string bogs that dot the area around the pass. So what are string bogs? Essentially they are interconnected micro lakes formed when peat and bolster heath plants (such as cushion plants) impede the flow of water in an already saturated landscape. 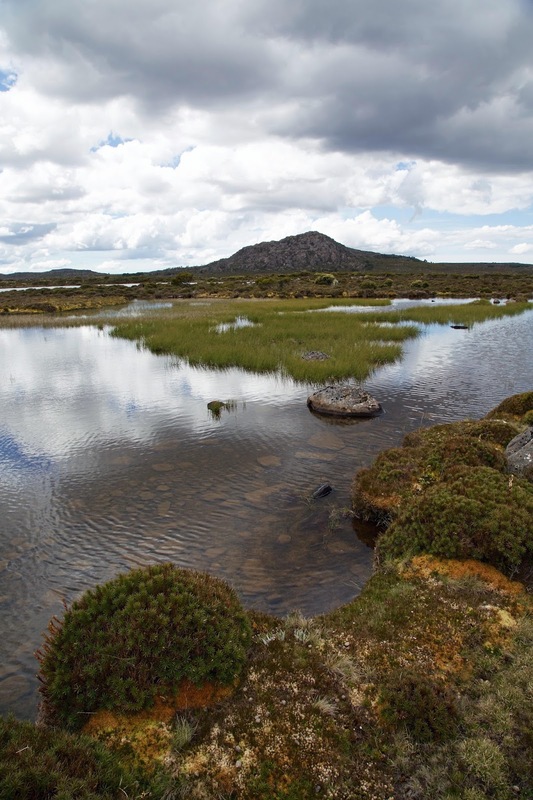 When Mt Field National Park was finally added to the Tasmanian Wilderness World Heritage Area in 2013, these string bogs were one of the reasons. 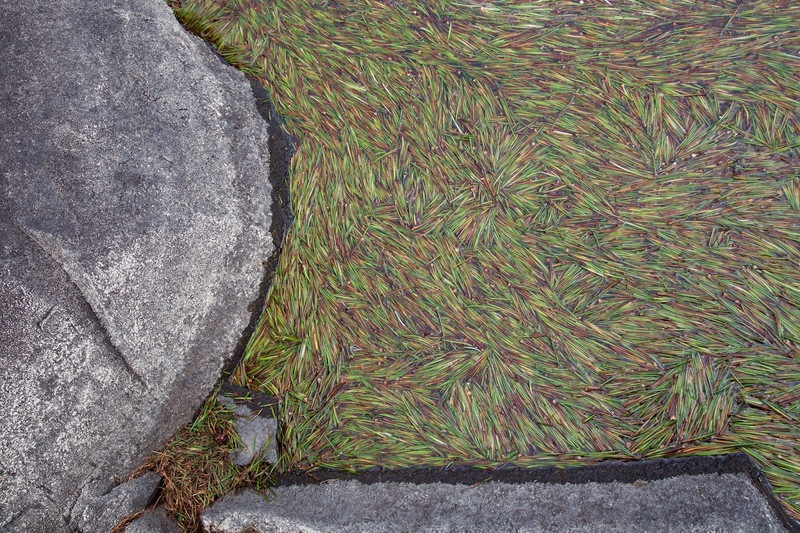 They are quite uncommon not only in Tasmania, but anywhere in the world. Bogs they may be, but despond and despair are keeping their distance. Not only do we stay dry-footed thanks to the excellent track work here, but even when we venture off-track for photos and a good look, the ground is far from “sloughy”. At an altitude of close to 1300m, and in a place that was under snow only 6 weeks ago, that’s worth celebrating. So too is the fact that the promised rain is still looking quite some way off. When such factors coincide, it’s worth dawdling. And given our high level skills in that department, we find seven ways to go not-very-far-at-all, starting with long photographic stops. Next we pause for a lengthy lunch among some adjacent boulders, accompanied by the kind of jokey conversation we like to pretend we’ve perfected by now. 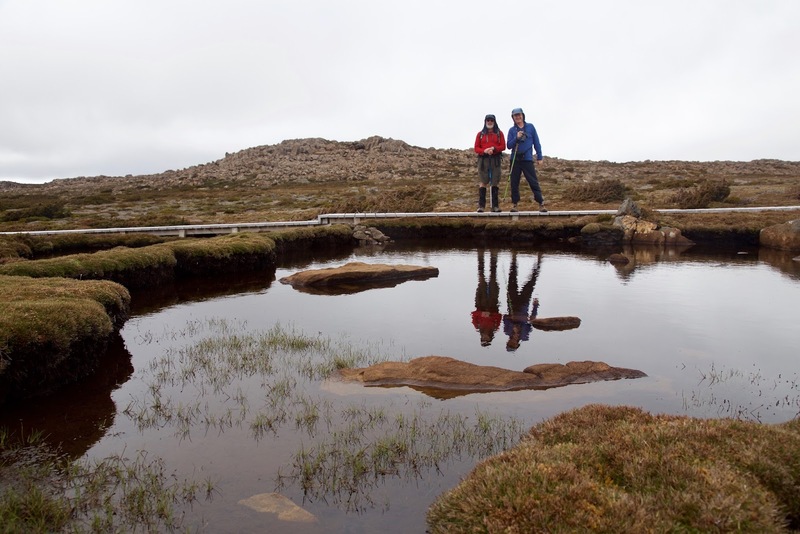 As we’re packing up lunch I mention that the watery bogs we’re looking down at are technically known as flark ponds. The hilarity level rises and carries us loudly towards our next destination: K Col.
By the time we’re scrambling up and around the Rodway Range, however, joke levels have declined. It's hard work, and while none of us is exactly despondent, Jim does start talking about it being wine o’clock. We know that, in his case at least, whine o’clock won’t be far behind. Still, there’s nothing for it but to keep walking. Some comical videoing, a little mobile reception to call home, and a visit from a pair of wedge-tailed eagles all do their bit to egg us onward. We know there will be some tangible, edible rewards back at the hut. 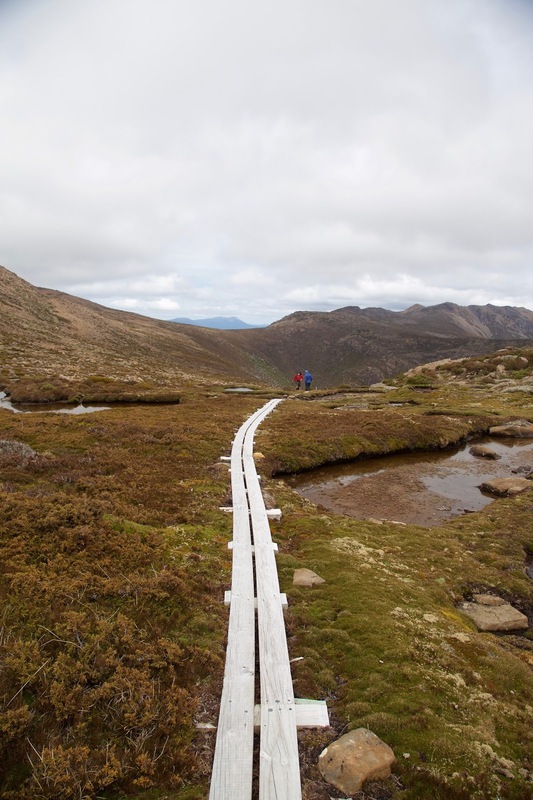 The intangible rewards of our hours among those heavenly bogs may take longer to work into our memories. But I suspect they'll be the longer lasting. Let’s start in the middle. It’s day two of a three day pre-Christmas walk. Tim and I have set off with few expectations, walking to an area neither of us knew and of which we’d heard little. It’s just good to be out in the bush, and on a walk that will allow Tim to test out his injured shoulder without too much risk or effort. In a case of worst-laid plans going aright, we’d discovered a delightful campsite, sheltered in a stand of pencil pines, just a short walk from a large lake. We’ve had a peaceful night and a lazy morning, and have wandered around the eastern rim of Middle Lake to the shore of Little Throne Lake. 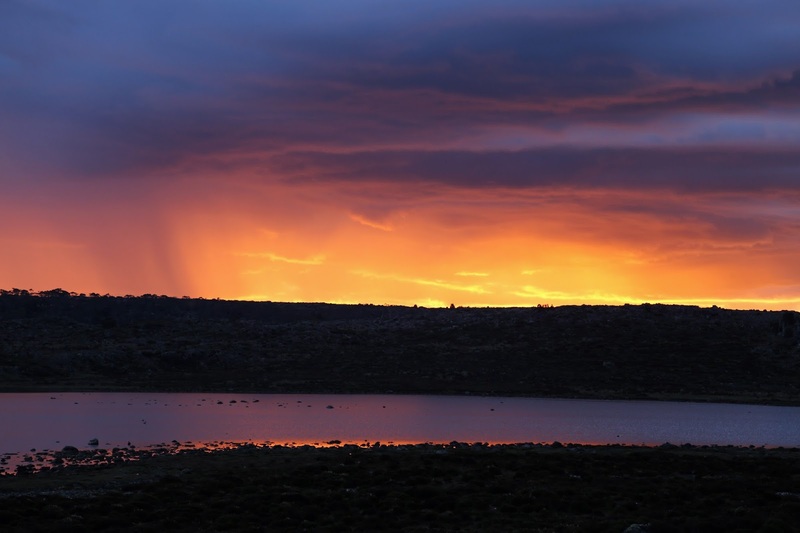 Of the hundreds of lakes that dot this part of the plateau, these two are among just a handful with names. The latter lake is named after the humble but conspicuous crag that sits above it: Little Throne. And here the games begin. Little Throne Lake has many spiral arms, making crow-flight walking impossible. We check our map; conjecture about possible short cuts; look at short wades that might get us to our destination more quickly. But we end up surrendering to its convoluted shore line, content to take in the ever-changing scene. At one point we pause to check out a wedge-tailed eagle that’s busy doing the same to us. She rafts on the warm air; circles with a slight tilt of a few feathers; sails towards us then away again: all the while keeping her head still and her eyes at least half on us. A corner or three later we’re entranced by rafts of wind and wave blown reeds that have accumulated at the lake’s outlet. We invoke Van Gogh, Mondrian and other abstract artists. But which of them could have created this incredible work, its pieces not only intricately and artfully stacked, but also undulating due to the water flow beneath them? After several minutes of enchantment we reluctantly depart for the summit of Little Throne the peak. The previous night we’d spied this knob from the summit of Blue Peak. While it’s lower than the surrounding peaks, its bluffy shape and cleft, gun-sight summit had invited further exploration. And so here we are, ascending through low scrub, on a sporadically cairned route, to the top of Little Throne. The games continue when we find that there are three contending summits. Fortunately it doesn’t take us long to ascend all three, and then we settle down to lunch with a grandstand view. 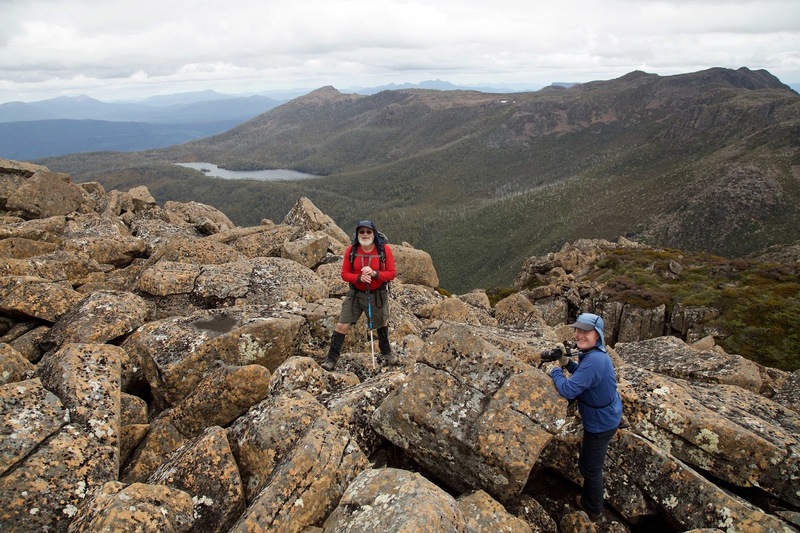 All around are landmarks that are familiar – the distant Walls of Jerusalem; the nearer Forty Lakes Peak; even our campsite beneath Blue Peak – as well as lakes that are largely unknown to us. Despite its relative lack of elevation, our little throne could just as easily be named Hundred Lakes Peak. I count more than forty just to the west. The count to the east would exceed that easily. Tim and I seem to have remarkably similar views on many things. We often come out with the same thought/joke/response at exactly the same time. This has led some believe that we were once joined at the hip. We respond, quite reasonably, that this would have made life remarkably difficult for our mother, given we were born five years apart! Nonetheless, when we come to our final game of choosing where we’ll go after lunch, it proves a short one. We simultaneously express the same preference for walking back around the far (western) side of Little Throne Lake. And so we do. Although it’s a much longer route, the journey back to our tent takes almost the same time as our journey out. We arrive back just in time to get inside the tent before the rain gets heavy. I snooze while Tim meditates (see, we’re not identical!) and the rain stops in plenty of time for cooking. 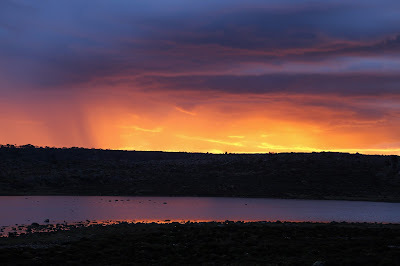 Afterwards we have another chance to photograph sunset over our unnamed lake, before heading back to the tent to discuss gratefulness. Because whoever has been rolling the dice for this walk, we’re very grateful. 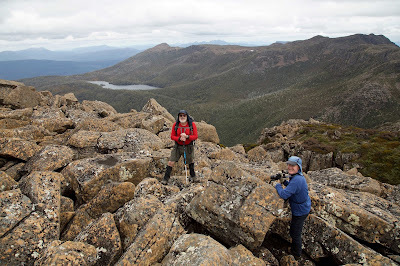 Our Blue Peaks/Little Throne sojourn has hugely exceeded our expectations. Who said it can't be all fun and games?